Soft, mushy and foul-smelling, the durian fruit (Durio zibethinus) is definitely an acquired taste. Fortunately, there is more to durian than its signature malodorous smell as it is packed with powerful antioxidants, vitamins, essential minerals and dietary fiber. Durian is a great addition to any diet as it is a great source of essential nutrients such as B vitamins, vitamin C, copper, manganese, magnesium and potassium, healthy fats and dietary fiber, all of which are necessary for keeping in good health. 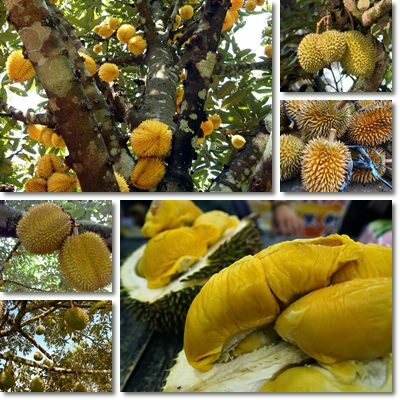 There are countless durian varieties and ten times more cultivars with specific traits, but only one has been made available on the international market and that is Durio zibethinus. What does durian look like? Durian is a watermelon-sized fruit (1-3 kg) with a hard husk covered in big thorns. Depending on the cultivar, husk color may vary from green and yellow to brown. Its edible creamy, but stinky flesh differs in quantity, color, taste and even pungency according to each cultivar in particular. Appearance. Durian flesh is divided into several segments held together by a fibrous, white covering similar to citrus pith. The riper the fruit, the less fibrous (softer) the ‘pith’. Depending on the cultivar, the flesh can range in color from creamy white to rich yellow and red and is edible both fresh and cooked in pastry, pancakes and other baked goods. Each fruit has around 10 large, almond-sized seeds. Because of its particular unpleasant odor, eating durian is not allowed in public institutions or on public transport services. At the same time, markets in Asia are overflowing with durian when it’s in season because of the high demand for this stinky fruit. What does durian smell like? Durian fruit stink. Their odor is often compared to rotten onions, turpentine, gasoline, dirty gym socks, sewers and dead things. The smell is so potent that it can stink up virtually anything, from apartments to buses and subway stations. At the same time, durian lovers (and there are a lot of them) say that the fruit also has a pleasant, musky fragrance about it, with a whiff of alcohol. Some even claim the fruit has a sweet smell, reminiscent of overripe citrus fruit or sweet melon. What does durian taste like? To durian lovers, the fruit has an enjoyable custard-like texture and a rich, slightly sweet, almond-like taste with vanilla, papaya, mango or banana notes. To those who are in the process of getting used to it, durian has a pleasantly creamy, sometimes stringy texture and a vanilla custard and pineapple taste with hints of garlic and a pungent rotting onions aftertaste. Last but not least, those who have completely given up on it say that the fruit smells like a rotting garbage bag with a mushy or butter-like texture and a moldy cheese and rotting onion taste. In the end, durian is an acquired taste and individual taste perception, dietary preferences, choice of cultivar or stage of ripeness may greatly influence the experience. 1) Great source of magnesium and potassium. For each 100 g of fruit, durian has about 8% of the RDA of magnesium and 9% of the RDA of potassium. Magnesium supports muscle health and activity, regulating electrical impulses that dictate the rhythmic contractions of muscles such as the heart muscle. Potassium regulates fluid balance and prevents water retention, a function that indirectly contributes to regulating blood pressure levels. 2) Boasts cholesterol-lowering properties. Unless you eat it in great amounts, durian exerts a beneficial action on cardiovascular health. Being a more than generous source of dietary fiber (3.8 g), it prevents the intestines from absorbing all the fats from the foods we eat, indirectly contributing to lower LDL (bad) cholesterol and triglyceride levels. 3) Relieves constipation and contributes to colon health. With 3.8 g of dietary fiber/ 100 g of fruit, durian helps regulate bowel movements and relieve constipation naturally. Moreover, by reducing transit time, dietary fiber limits the time our colon is exposed to the toxins our bowel movements, thus protecting the colon mucosa. As a result of its fiber content, it’s also a good food for hemorrhoids. 4) Good source of B vitamins. Durian fruit have been found to be a good source of essential B vitamins such as pyridoxine or vitamin B6 (24% of average daily requirements), thiamin or vitamin B1 (31%), riboflavin or vitamin B2 (15%) and folate or vitamin B9 (9%). B vitamins help convert macronutrients such as carbohydrates, fats and proteins into energy to fuel our body, support brain function and digestion. 5) Good source of copper and manganese. 100 g of durian provides about 23% of the RDA of copper and 14 % of the RDA of manganese. Copper supportts normal growth and development, contributes to the formation of connective tissue, boasts antibacterial and anti-aging properties (it prevents premature hair graying). Manganese is a powerful antioxidant with fertility, thyroid and bone health related benefits. 6) Good source of vitamin C. With 33% of the RDA of vitamin C, durian fruit help improve the immune response by ensuring the body is better prepared to deal with viral or bacterial infections. Moreover, vitamin is is an excellent natural antioxidant and anti-inflammatory, ideal for chronic disease prevention. 7) Rich in powerful antioxidants. According to a study published in a 2008 issue of the International Journal of Food Sciences and Nutrition, durian fruit are rich in potent antioxidants in the form of polyphenols (gallic acid), flavonoids (catechin) and anthocyanins (cyanidin-3-glucoside), caffeic acid and the flavonol quercetin. Antioxidants such as caffeic acid have been shown to successfully inhibit the growth of cancer cells in laboratory cultures. 8) Boosts energy levels. Durian fruit are a great source of essential nutrients such as B vitamins and dietary minerals and boasts a generous energetic value (147 kcal). As a result, they are satiating and nutritious, providing sufficient energy for everyday activities. While adding one more nutritious food such as durian to your daily diet may help augment your nutrient intake during pregnancy, there is no research at this point that proves durian is a must for expecting mothers. However, with 147 kcal/100 g of flesh, durian qualifies as a fatty fruit, so consuming it with moderation is pivotal in order to keep in good health. Also, remember that the suIphur content of the fruit may inhibit a liver enzyme responsible for toxin elimination; as a result, it is not recommended to pair durian with alcohol as it may cause you to feel unwell. But rest assured, studies say it is not life-threatening. In all other respects, durian is satiating and nutritious and thus makes a great addition to any diet, as long as you can take the smell and the durian-scented burps that may follow.